The Mayflower Montessori infant program is designed for working parents with children 6 weeks to 12 months old. We have experienced teachers and dedicated staff who will see to your child's individual needs. Our excellent teacher-to-child ratios (4 to 1 for infants through toddlers) ensures children are provided with a secure and nurturing environment filled with love and trust. In following the Montessori Method, we offer a carefully prepared environment where children can develop naturally at their own pace. Our infant classroom is designed for safe and stimulating exploration and adheres to the highest standards of cleanliness. Meanwhile, our teachers utilize learning materials designed to meet the specific needs of your child's current developmental stage. 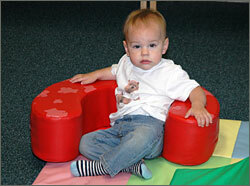 Our infants also receive extensive language exposure through games, songs, conversations and positive talk. We use an on-demand schedule to ensure that each child's specific needs are met. Children are fed when they are hungry and are put to sleep when they are tired. Allow each infant to follow his or her own pattern of sleep and awake times. Infants are placed on their back during all sleep times. Provide opportunities for the infant to move freely by crawling and exploring in a safe, clean, warm, open and uncluttered area. We often use music to provide a more enjoyable atmosphere. Make sure each child receives physical contact and individual attention throughout the day. 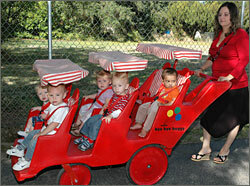 Examples include being held, rocked, talked to, read to, sung to and taken on walks inside and outside the center. When a child has emotional or physical needs, we make sure to give them immediate attention. Use routines relating to bedtime, feeding and diapering activities as opportunities for language development, building the child's esteem and other learning experiences. Encourage children to play with a variety of safe, age-appropriate infant toys, materials and equipment such as blocks, flash cards, books and puzzles. 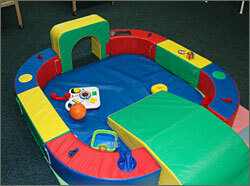 Provide opportunities for each child to use the five senses through sensory play and develop their gross motor skills. We strive for a balance between active and quiet activities with opportunities for both individual and group activities. Encourage the development of self-help skills (dressing, washing, eating, etc.) as infants are ready. 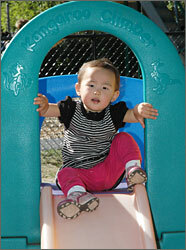 Include physical activities such as walking and climbing when infants are ready. Provide activity areas that are not used by older children at the same time and have outside playtime as weather permits. Complete a Daily Infant Sheet with the child's morning activities; e.g. wake-up time, breakfast or bottles consumed, emergency phone numbers, pick-up person and time plus any special instructions. Supply enough food and formula/mix for the day. Please note any unusual foods you provide so we know what it is. If your child is allowed to partake in school lunch or snacks, let us know and we can provide a menu. Bring at least two complete changes of clothing, which can be kept in the room and replenished as needed. Mark your child's name or initials on everything including blankets, clothing, bottles, cups and food containers. Complete and sign a Medical Authorization form for any medications you need administered to your child. You are always welcome to call or drop in at any time to check on your child. To avoid disrupting sleeping, feeding or changing schedules, please try to keep any visits short. If you have any questions or concerns, please feel free to ask any staff members. However, any lengthy discussions should be scheduled in advance so our staff members can continue to provide the excellent level of supervision we require of them. We look forward to getting to know you and your baby and assist with their development during these important first months.